Of all the things driving medical costs higher, none gets attention quite like specialty drugs. With prices increasing to the tune of 17 percent to 31 percent a year, it’s not a surprise that these drugs are under intense scrutiny. Specialty drugs – those that are used to treat complex conditions or reach a limited number of patients – make up just 1.8 percent of all U.S. prescriptions. Yet they account for 43.2 percent of drug spending, according to a study released early this month by researchers at the University of North Carolina at Chapel Hill. “There’s a story here of very expensive drugs used by relatively small groups of patients for conditions for which there are few options,” UNC researcher Stacie Dusetzina says in a statement announcing the study. Claims data from Blue Cross and Blue Shield of North Carolina bears out these national trends identified by the UNC study. Specialty drug spending led the way last year among all categories of health care costs that the company tracks – up 33.8 percent in 2015 alone. 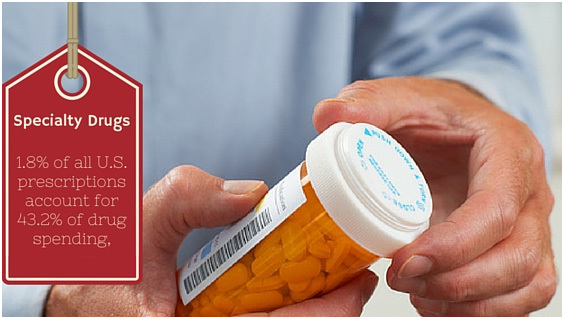 Many specialty drugs have earned poster-child status for rising prescription drug costs. Like Sovaldi, the hepatitis C drug priced at $84,000 for a 12-week course when it came out two years ago. Or Humira, the rheumatoid arthritis treatment that is the single biggest drug expense to health plans – topping $1.1 billion nationally in 2014, according to the UNC researchers. There are other, lesser-known examples. Estay Greene, BCBSNC’s director of pharmacy programs, says the company continues to keep an eye on the following expensive drugs to see what steps can be taken to help keep costs down. This diabetes drug is a branded, extended-release form of generic metformin. It largely flew under the radar until last year. That’s when Valeant Pharmaceuticals jacked up the price by roughly 800 percent. By the end of last year, the drug was costing BCBSNC and its members $1.3 million a month in pharmacy claims expenses. Earlier this year, a new generic equivalent of Glumetza hit the market. And we put in place new rules for physicians and pharmacists. Those include prior review – when doctors certify in writing that the drug meets the patient’s needs – and step therapy, which calls for trying other medications first to see if they’ll work before moving on to the more expensive option. Launched in April 2015 as an injectible weight-loss drug, Saxenda costs about $1,000 per prescription. Our total claims costs were $306,000 in June 2015. By December, monthly claims had eclipsed the $1 million mark. An interesting thing is happening with Saxenda: A relatively significant percentage of patients who try it don’t stick with it. Out of the 223 BCBSNC members with prescriptions for the drug in June 2015, only 59 of them had filled a prescription at any point during the first three months of 2016. Some patients have reported difficulty with side effects. We continue to monitor Saxenda for both its usefulness to members and its costs. This class of drugs is used to help cancer patients boost their natural defenses to the disease. They’re among the most costly of all medications, sometimes costing $150,000 a year per patient, and even up to $1 million annually when two or more drugs go together for combination therapy. Specific drugs that result in high costs include Opdivo, used to treat certain types of melanoma and non-small cell lung cancer; a related drug called Yervoy used in combination with Opdivo to treat melanoma; and Keytruda, a non-small cell lung cancer treatment. Greene says that as immunotherapies are often the only choice for cancer patients, they continue to be an important part of health plan members’ covered benefits – typically under medical coverage instead of pharmacy benefits. Arm yourself with information. It’s a good idea to go to your doctor’s appointment with the latest information on drugs available to treat your health condition. You might be able to find a generic that will meet your needs. Use BCBSNC’s online formulary to look up drug information and compare out-of-pocket costs, as well as find money-saving tips on prescriptions, available through the Blue Connect member login. Tips include asking for alternatives like generics, ordering a 90-day supply and having your doctor review your medication checklist. Get ready to ask your doctor questions once you’ve done your homework. In many cases physicians will work with you to find the best treatment at the lowest cost to you — but you need to ask, rather than wait to see if the doctor brings it up.